I have explained the formation and the use of the first conditional. 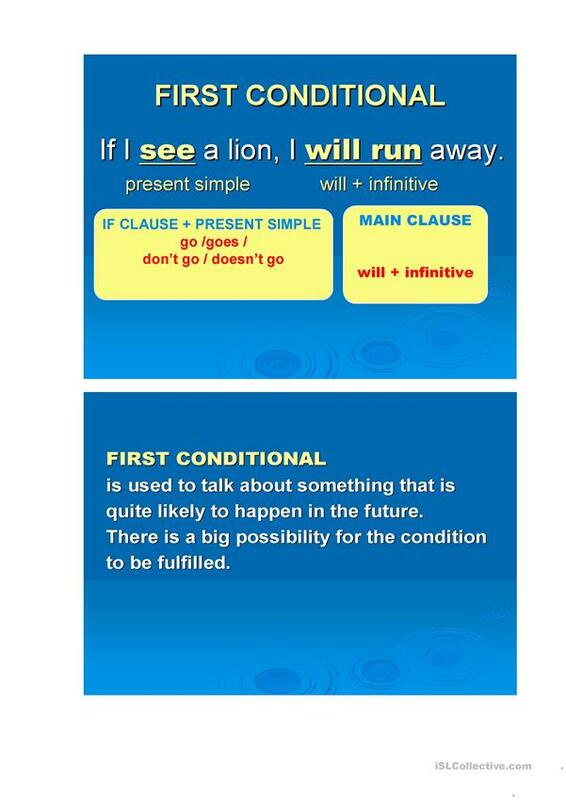 This explanation can be used for any type of students who want to learn how to form the first conditional. The present downloadable handout is a great resource for business/professional students, high school students, elementary school students, kindergartners and nursery school students, adults and students with special educational needs, learning difficulties, e.g. dyslexia at Elementary (A1), Pre-intermediate (A2), Intermediate (B1), Upper-intermediate (B2), Advanced (C1) and Proficient (C2) level. It is a useful material for teaching Conditional I (first) in English, and is a valuable material for working on your students' Reading and Writing skills.